In my search for the ultimate cone 6 porcelain, I really lucked out when my buddy Jim Gottuso, AKA Sofia’s Dad, generously offered me some of his clay to try. Jim puts his pots through hell and back, just as I do. He does this in the form of a process he calls “water etching” also called “hydro-abrasion”. Basically, parts of the dry but unfired clay are protected with shellac, and then water and a sponge are used to wear away the clay, yielding a relief design. This is not easy on the clay. Jim’s pots get soaked and then dried numerous times before they are completed, so I’m thinking that clay he’s using must be really forgiving. This clay, Laguna #16, also called Miller #617, is a porcelain marketed for cone 6. On their website, Laguna describes it as “Grolleg Cone 6 porcelain similar to #15 with more ball clay, making it less white, more plastic and forgiving. Additional silica reduces crazing in some glazes. Good for slab forming.” Now, I have to hand it to them, Laguna really knows what is important to include in a description! Rather than something like “a dream to throw” there is some useful and honest information geared toward guiding the customer to the correct choice for their needs. Amazing. This is one of those clays that needs to be “shocked”, or thrown down on the floor with force, before use. It felt very hard, but after I did that, it was the perfect consistency, soft and pliable but not at all sticky or slumpy. The consistency is very dense and very smooth. It is amazingly white in appearance. As white as Helios. 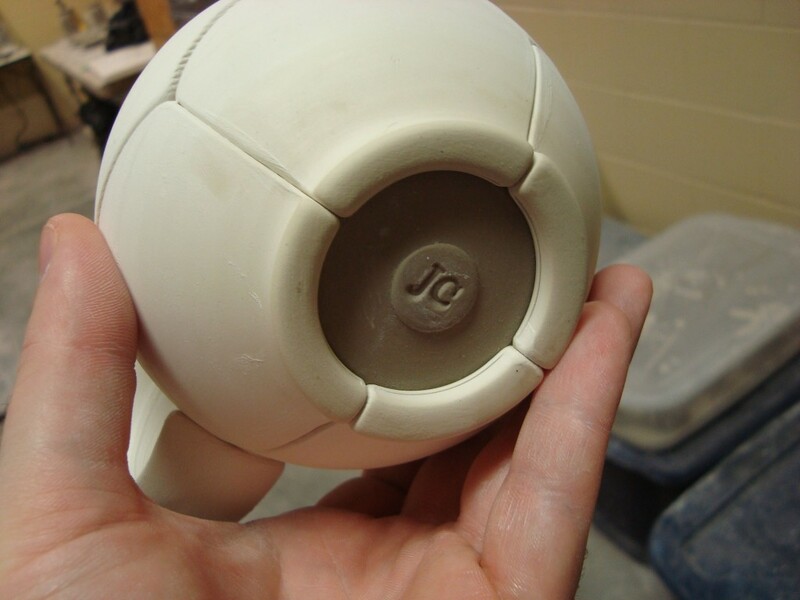 Below is an image of a cup made of it, with my clay making up the disc. Bear in mind that my clay is also a porcelain, which fires much whiter than any of the clays already reviewed with the exception of helios, but only slightly less white. I begin to throw a bowl. Compared to my very grainy clay body, this stuff feels incredibly smooth and wonderful. 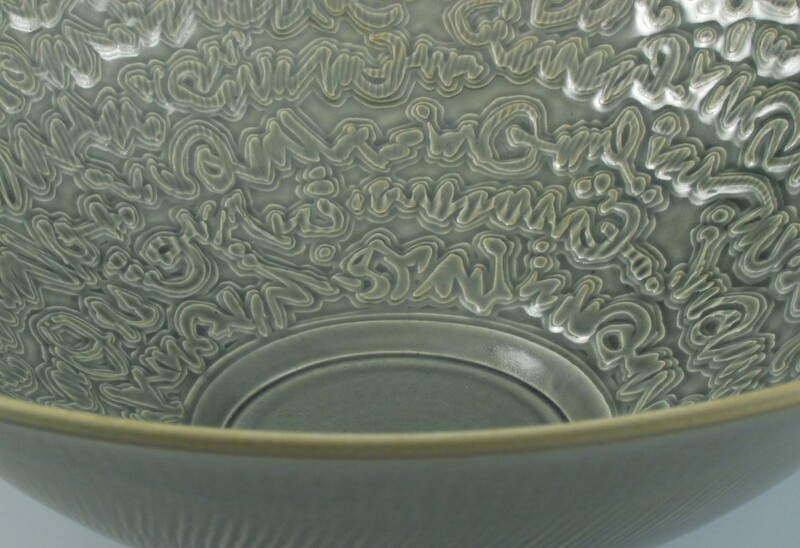 I am pleasantly surprised when my exact form of a bowl just realizes itself on the wheel. the clay goes where I put it and doesn’t move. There is perhaps a bit of the typical slump, but not anything that would jeopardize the roundness of the lip the way helios slumped. I already feel good about this clay. The bowl transfers off the wheel with no problems. Again, with the tumbler, the form simply appears between my hands. There is no struggle to translate what I do with my normal clay into this clay. It happily goes where I want it. It collars back in with great enthusiasm. The tumbler went nicely thin, testing the lateral strength of the wall – it is strong. There is a nice balance between tooth and plasticity. I think I’m in love. I will report on this more later, but of the 5 clays tried so far, all of the others were eliminated for glaze fit issues or just that they weren’t white enough for my glazes to look good. This is the only one that I have decided to finish the pots with. I was amazed to find that the properties during leather hard actually lend themselves to my process much better than my current clay! Not only will this be a sufficient substitute, but I have realistic hopes that it will make things possible that weren’t before. The next step will be to order 100 pounds and try out a kiln-full, and I can’t wait! Your ‘Throwdown’ is really useful and timely for me. I am trying to find a happy ^6 porcelain, and have been using the Laguna #15 and #16, as well as the Standard 213. My favorite to work with is the 213, but it really is too creamy a color when fired, almost yellowy. I want white, really white. The 15 is gorgeous but too finicky, cracking when drying, esp. handles, and crazing. But when it works, I love it. I am finding that #16 seems to have it all, although the unglazed clay is not quite as beautiful as the 15. I am thinking about trying Tucker’s MP5 Mid Porcelain. Have you thought about that? Thanks for taking the time to do this, it’s really helpful, and I do love the way you describe the nitty gritty! Never even heard of Tucker clay. If this laguna works out with my glazes, I’ll stick with that, in which case, The throwdown is over, as I really don’t have the money to buy clay just for the purpose of blogging about it. I’m really hoping that #16 has it all. I have the same problem with 213. It is a dream to work with, but man, it is REALLY yellow/beige when fired. If I end up getting my hands on some various clays, I will certainly blog it up though. this has been fascinating. I love #15, which is very white and throwable, but don’t even consider adding attachments to it. I have a box of #16 in my studio, which i found to be really HARD. I’ll give the shocking method a try. I am using standard #551, which is awesome, but looks so-so when left bare, which is 3/4 of my piece. The #15 is very tight. #16 you say? OK. I’ll give it a shot. I need white, dammit. ok. I just realized I said what Vicki said. Sorry. Thank you for sharing! I have no other choice than to high-fire at the community studio I’m in now, but I’m eager to switch to ^6 as soon as possible. Perhaps I’ll find a kind potter nearby who would share their kiln with me. I’ll keep this in mind. I am new to throwing pots and really liking it. Curently I am using Soldate 60 to get ready for a Naboragama firing in Pope Valley Ca in Nov. 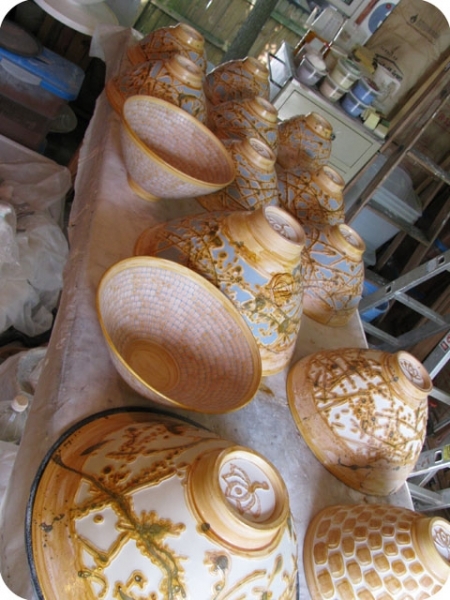 Yet I want a whiter clay for the Raku kiln I am building plus I want to do sawdust firings here at home. How well does this clay work for the new potter, I like the tooth of the Soldate 60 and it forgives a lot of what I do to it. i too am looking for a new and perfect cone six clay body!! i’m so glad to have found this site, and y’all!! i live in oregon, and have been using seattle pottery supply’s Willamette Red, which is a beautiful buff at cone six, but sadly, i have discovered, slightly underfired. they call it “cone 6-10”, but really i believe it is an 8-10 clay body. it holds up pretty well, but i still haven’t come a glaze that won’t craze on it, and i would like the ware to be a bit stronger than it is. so i’m sifting thru all this info, and “213” came up…a dream to throw with (my #1 requirement) and “yellow beige at cone 6” (my other #1 requirement). if you happen to know anything about “213”, would you take a peek at my etsy site and see if the body looks similar?? [img]www.etsy.com/shop/AmyPalatnick[/img] thanks dear potters in advance!! Hello – where can I order this Laguna #16 porcelain? I am so glad to hear that others have had the same problems with the 213 that I have had. A dream to work with, but NOT white enough. Interesting comments – thanks. I used 16 for almost a year and was pleased with it in every way – except that it simply doesn’t seem too amenable to high cylinders: I can pull it just so high and no higher. I do recycle endlessly, so this might have something to do with it. Have tried a number of Standard clays. 551 is a dream except for the pinkish color; 213 is OK but grayish; 365 is nice and white but very hard to throw compared to the others – also not so good for sculpting b/c it seems to slough too readily. Trying some Sheffield Pottery white stoneware now, but thus far not impressed. I guess it’s back to 16 (maybe I got spoiled?) with some other clay reserved for really high pieces. I highly recommend Tucker’s 6-50 Stratford porcelain. It’s whiter than MP5 mid porcelain and works well for both handbuilding and wheel work. And you can push it a little past ^6. How high do you bisque the #16? I bisque a slow cone 05.